Mobile is mentioned a grand total of 254 times in Alibaba’s IPO filing out today — underscoring the influence that phones and tablets have on Alibaba’s business today and will have in the future. While companies like Amazon, eBay, Groupon and Square are all targeting the mobile commerce opportunity, for Alibaba is already a powerhouse through services like its Taobao e-commerce mobile app, and its Alipay mobile payments service. Mobile also has an indirect impact on Alibaba’s bottom line. Like Amazon, Alibaba has a strong presence in cloud and web services, in its case through Alibaba Cloud Computing, which is used by a number of mobile developers to host their apps and offer a number of other database services. In the three months ended December 31, 2013, mobile gross merchandise volume — the amount of aggregate sales made on its platform — accounted for nearly one-fifth, or 19.7%, of its total GMV, a strong increase from 7.4% of GMV in the same period in the previous year. That works out to $16.7 billion. Alibaba says it accounted for 76.2% of all mobile retail GMV in China in the year to December 31, working out to $37 billion in mobile GMV. Although Alibaba does not break out mobile revenues specifically in the F-1, it notes that total revenues for the nine months that ended December 31, 2013, were $6.511 billion. It’s not a completely accurate picture, but roughly speaking if you apply that 19.7% GMV figure that is attributed to mobile, that works out to $1.28 billion in mobile revenues. Of course that could lower if people are making less or smaller purchases on mobile but it’s a rough guess. But the opportunity is still fairly untapped. Right now China is approaching nearly as many mobile internet users as it does fixed internet users overall: 500 million versus 618 million. 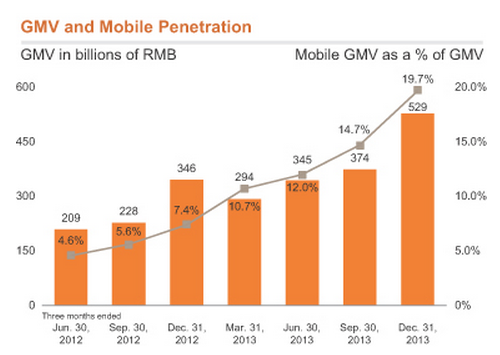 Alibaba is already a go-to platform for over one-fifth of those users, with 136 million mobile monthly active users. Alibaba, focused on commerce in China first, dominates mobile commerce in China by a wide margin. In inthe year ended December 31, it accounted for 76.2% of all mobile retail GMV in the country, not including virtual goods, according to figures from iResearch cited by Alibaba in the report. “Our Mobile Taobao App has been the most popular mobile commerce app in China by mobile MAUs every month since August 2012,” the company writes. That app has been out since 2010. There are also a number of investments that Alibaba has made in other mobile services. They include UCWeb, a Chinese developer of mobile web browsers in China. “We currently hold approximately 66% of the economic interests of UCWeb in the form of convertible preferred shares, which we had acquired over several years through several rounds of investments, the last of which was completed in April 2014,” Alibaba says. Similarly, it has taking a large stake in the social media platform Weibo, which has also had a strong mobile play. That includes a strategic alliance for social commerce and marketing (using Alipay); as well as a $586 million investment for an 18% equity stake, which Alibaba increased after Weibo’s IPO last month. Then it purchased another $449 million in shares, taking its stake in the company to 30%. And it has started to get more involved in mobile messaging, taking a 20% stake in one of the bigger contenders called Tango, for $200 million in March 2014, adding another $17 million to keep its 20% stake in April 2014.